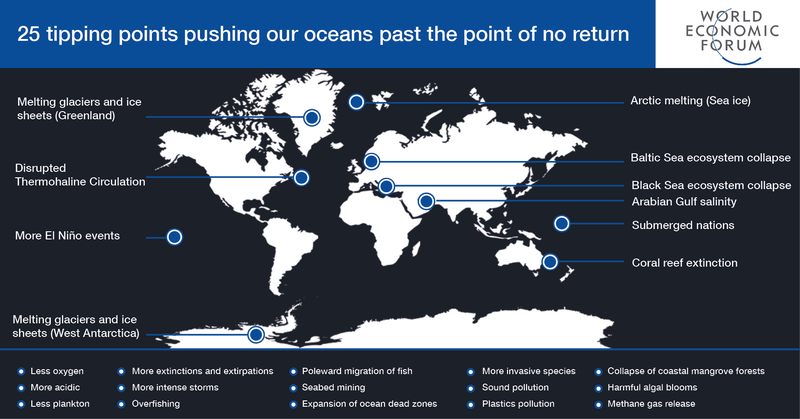 Globally, our oceans are losing oxygen, with low-oxygen areas rapidly expanding in deep waters, impacting ocean animals. Low oxygen areas have expanded by 1.7 million square miles over the past 50 years, decreasing the amount of oxygen in our oceans by 2% globally due to global warming. Each degree of ocean warming reduces the concentration of oxygen in the ocean by the same amount by drawing out the oxygen. By the end of the century there could be a 3-6% decline in ocean oxygen. This decrease in oxygen has had dramatic impacts on ocean animals, killing some and impacting how others live, especially those in deep water where oxygen levels are naturally low. Oceans have become 30% more acidic over the past 50 years. When carbon dioxide (CO2) dissolves in seawater, carbonic acid is produced and the acidity of the oceans increases. Acidic seawater is already dissolving the calcium carbonate shells of planktonic species in the Southern Ocean. Unabated, increasing acidification could cause whole ecosystems to collapse from disrupted food chains. Planktonic plants support the marine food web, generate half of the world’s oxygen and also slow climate change by absorbing CO2 from the air, but their populations have declined by 40% since 1950. Scientists believe warming surface temperatures are to blame for their decline by changing their metabolism in ways that reduce productivity. A network of currents flow around the world's oceans, each of them driven by differences in water density (thermohaline circulation, or THC). Of these, the best known is the North Atlantic Gulf Stream. The Gulf Stream's flow has slowed 30% over the past 30 years as a result of rising temperatures. Disruption in the global THC could have dramatic and unpredictable impacts on weather, climate, agriculture and civilisation. Fifteen marine animals are now extinct due to humans - and more are at risk. Populations that show signs of collapse include tuna, sharks, large rays, sea turtles, marine mammals, deep sea fish, Antarctic krill, seabirds and others. Some species are iconic and have special cultural and even spiritual significance for people; the great success of efforts to 'save the whales’ gives hope that similar efforts could restore many such species to their former abundance and importance, while sound policy and science could help restore the solely commercial species. Global warming has doubled melting rates in Greenland since the 1990s. Meltwater from Greenland - which contains the second-largest body of ice, after Antarctica - accounts for one-third of all sea-level rises. If all the 660,000-cubic miles of glacial ice on Greenland melted, the global sea level would rise by over 20 feet. Freshwater from the Greenland glacial melt could also disrupt thermohaline circulation, including the Gulf Stream. The Antarctic icecap, which is up to 9,000 feet thick, contains 70% of the world’s surface freshwater and more than 90% of the world’s freshwater ice. The 530,000-cubic mile West Antarctic Ice Sheet (WAIS), is particularly vulnerable to melting because much of it lies below sea level. Loss of the WAIS would raise the global sea level by more than 15 feet, with catastrophic social and economic effects. Arctic sea ice has decreased by 13% each decade. The region is expected to be ice-free in summer by 2025 for the first time in 100,000 years. A decrease in sea ice will dramatically disrupt marine ecosystems, especially ice-dependent wildlife such as polar bears and seals, and some fisheries. The oceans' heat powers weather systems and storm formation. Warming oceans may have increased the power and duration of hurricanes, typhoons, and destructive storms generated over the tropics by 50% since the 1970s. Changing ocean surface temperatures are also causing more erratic weather patterns all over the planet with widespread effects on human health, agriculture and economic activities. About 30% of the world's fisheries are overexploited or depleted. Harmful fishery methods also destroy habitats and harm fish populations. The populations of some species, such as bluefin tuna, which can live to 20-50 years, have collapsed by over 90% in the past 40 years and will take decades to fully recover. A significant part of the problem is unreported and unregulated fishing practices account for more than 11 million tons of fish catch each year. Fish populations are moving toward cooler waters as sea temperatures rise. Given current forecasts for temperature rises, populations are estimated to shift about 10 miles further poleward every decade. Species that are unable to adapt or move will decline or disappear. Fish movements may have economic impacts on human communities that have traditionally depended on them. By 2050, 90% of all tropical reefs will be threatened with extinction from heating, overfishing, and coastal development. Coral reefs may survive in special places, such as locations cooled by upwelling or currents, but they will suffer heavy losses in most tropical regions, as will the human communities dependent on them. In addition, increased ocean acidity (see above) may increasingly inhibit calcium carbonate formation that form coral. By the end of this century, global sea levels will likely have risen by 1-3 metres. Island nations with an average elevation of around 3 metres - such as Kiribati, the Maldives, the Marshall Islands, Tuvalu, and the New Zealand territory of Tokelau - will be uninhabitable due to submergence or over-wash from storms, unless radical adaptation strategies are employed. Globally, over one billion people will be displaced from low-lying coastal regions. Overfishing in the 1970s followed by pollution and the arrival of an epidemic invasive species in the 1980s caused the Black Sea ecosystem to collapse. More than 80 million people in six nations live around the Black Sea, a 436,400 square kilometre (km2) body of water separating eastern Europe and western Asia. Since the 1990s, pollution control and other management measures have had positive results. The Baltic Sea, the world’s largest brackish-water system, shares many similarities with the Black Sea and offers many of the same lessons. Nutrient pollution, cod fishing, the impacts of shipping, hazardous industrial pollution and the dangers posed by World War II munitions all plague the Baltic ecosystem. Rare earth elements (nickel, cobalt, manganese and others) are in high demand by industry. They are also abundant and of higher ore quality on the seafloor than on the land. Extraction is challenging where mine sites are thousands of feet underwater and the environmental regime is still being developed. Already an area the size of Mexico has been licensed for seabed exploration including the Clarian Clipperton Fracture zone in the Pacific Ocean and around dormant hydrothermal vents. Ocean dead zones have doubled in frequency every decade since the 1960s. Their main cause is land-based pollution, including runoff from agriculture, animal feedlots and human sewage, that stimulate planktonic plants in huge population blooms that eventually die, decompose and use up all the water’s dissolved oxygen, creating a dead zone. Global warming will likely worsen dead zones around the world. Species that are introduced into areas in which they are not native and which become ecologically established are invasive and can have negative ecological, economic or health consequences. Ships are a major vector for invasive marine species, primarily by ships taking on ballast water in one location and dumping it elsewhere. Species may also hitchhike on ships’ hulls, floating debris or litter. The recent growth of non-native and venomous lionfish in the Atlantic is one of the most well-known examples. The 240,000 km2 Arabian Gulf lies at the northernmost end of the Arabian Sea, surrounded by Iran, Iraq, Kuwait, Saudi Arabia, Bahrain, Qatar and the United Arab Emirates. Desalinisation plants in these arid countries supply more than 5 million cubic metres of drinking water per day to the region’s 43 million citizens. Brine discharge from desalination could affect all marine life in the region. The number of El Niño events has risen each decade and is set to double in frequency as a result of global warming. El Niño begins as sunlight and ambient air temperature heats surface water in the western Pacific Ocean around Indonesia by 3-5 degrees Celsius above average. This warm pulse of water eventually moves east to the coast of South America where it disrupts upwelling that affects fisheries, seabird populations, and weather patterns on a global scale. Shipping has increased four-fold in the past 20 years, with a corresponding increase in underwater noise. Intense sound is also produced during seismic surveys for oil and by military low-frequency sonar. Sound generated by seismic surveys in the Arctic is increasing as melting sea ice allows access for oil exploration. Without effective ‘quiet ocean’ initiatives, human-source noise will increase steadily throughout the ocean, affecting many large marine animals such as whales and dolphins. There are over 5 trillion pieces of plastic trash in the oceans, a figure that is increasing at a rate of 8 million tons per year. The 20-fold increase over the past 50 years is expected to double in the next 20 years. Plastic slowly degrade to micro-plastic, which is ingested by ocean animals - some of which we eat. A recent study estimates there will be more pieces of plastic than fish in the ocean by 2050. Coastal development has destroyed over 60% of the world’s mangroves. Each year we lose a further 1%. At this rate, all unprotected mangroves could be lost within the next 100 years. Since mangroves slow global warming by trapping carbon dioxide, provide nursery areas for ocean wildlife, and protect coastlines from erosion and flooding, their loss would have diverse negative implications. Harmful algal blooms (HABs) have increased in frequency, severity and geographic distribution due to global warming. HABs produce dangerous toxins that kill marine organisms, taint shellfish, cause skin and lung irritations, and contaminate air. In 2016, HABs killed 20% of Chile’s farmed salmon, causing the world’s second-largest exporter of salmon to lose more than $1 billion. Intermediate-depth warming of ocean water could be enhancing methane release from ocean sediments around the world. One study in the Pacific Northwest shows that the warming ocean in that area is already causing the transformation of methane hydrates to gas in amounts that over the course of a year equal the methane released from the 2010 Deepwater Horizon blowout in the Gulf of Mexico. Methane is 30 times more potent as a warming greenhouse gas than CO2, and is also being explored as a possible source of offshore fuel.